I had a great Mother's Day. 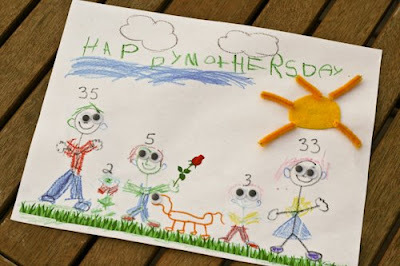 I got musical cards from each of the kids ... and Mason made the above picture for me, with the help of his Daddy ... I love it! You will see it has the whole family, with our ages and everything. Nika didn't get any googly eyes though, because her head was too small. Crazy kid. I also got Jillian Michael's workout for the Wii. Kyle said that Mason was so excited to buy this for me ... apparently they were walking through the store when Mason saw it, recognized Jillian from the book I'm reading and had to buy it for me. When Kyle asked Mason where he wanted to take me for Mother's Day, Mason said ... bowling. Alrighty then. 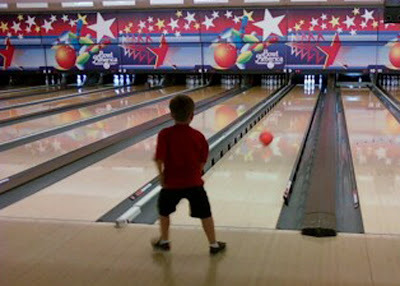 The kid has never been bowling in his life, nor do I know where he got this idea ... but bowling it is. Someone please remind me when the last time I bowled was. We walked into the bowling alley and the first thing I noticed was that the guy behind the counter was smoking. Guess they haven't gotten rid of that rule! And as tempted as I was to order a hamburger and french fries from the grill, I was pretty sure that it would taste nothing like it did at the good ole Waunabowl. Anyway ... I was very impressed that they carried bowling shoes that would even fit Payton ... a teeny size 7. They were pretty cute. We got two lanes ... one with bumpers and one without. Whatever happened to the blow up bumpers? Nowadays they pop right out of the gutter ... who knew? And they even brought a little ramp out for Payton to use ... so cute. Oh what fun! 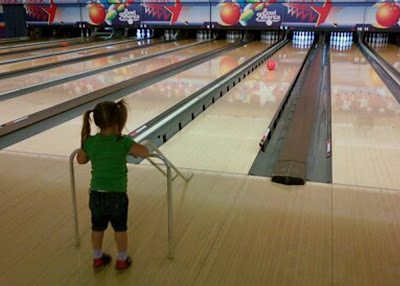 Thank goodness for bumper bowling...I'm useless without those bumpers!